Minced jalapeños bring a nice bit of heat to both the chicken and the couscous. In large sealable plastic bag, place chicken and pound to 1/4-inch thickness. On plate, mix together flour, garlic salt, cumin, and pepper. Dip chicken in flour mixture, turning to coat. In large non-stick frying pan over medium-high heat, heat 2 teaspoons of the oil. Add two breast halves and cook about 5 minutes or until lightly browned and fork can be inserted into chicken with ease. Wipe pan clean and repeat with remaining oil and chicken. To frying pan, add chicken broth and jalapeño pepper; bring to a boil, stirring to loosen brown bits. 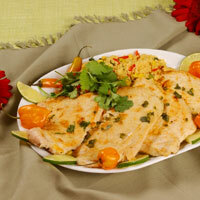 Cook about 3 minutes to reduce by half, remove from heat and stir in cilantro and lime juice. Peppered Couscous:In small saucepan, mix together chicken broth, frozen corn kernels, sweet red pepper, jalapeño pepper, pepper blend, and salt. Bring to a boil over high heat. Stir in uncooked couscous. Stir in thinly sliced cilantro. Place couscous on serving dish and arrange chicken on top. Spoon sauce over chicken and garnish with cilantro sprigs and lime slices.